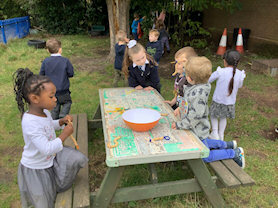 In Early Years both the indoor and the outdoor classroom are used to deliver the EYFS curriculum on a daily basis. In Reception the environment is dressed to capture the children's imaginations and changed to facilitate their needs and learning. Young children learn best through play and it is through first hand experiences that they become engrossed in learning therefore the majority of our learning episodes are delivered through play based activities. 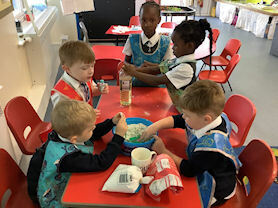 Our children participate in a mixture of adult led and child initiated activities which are all carefully linked to the Early Years Foundation Stage Profile. 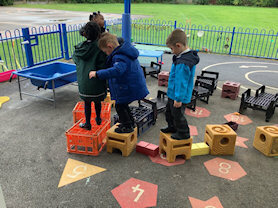 Children are observed in their independent play to inform their next steps in learning. The areas of development are communication and language, physical development, personal, social and emotional development, literacy, mathematics, understanding the world, expressive arts and design. 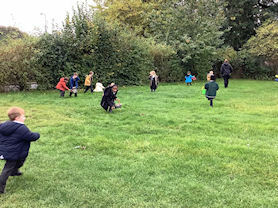 After reading Cinderella, children measured their own foot and then created their own 'lost slipper'. Children have been using Numicon to double numbers up to 20. Our water tray was turned into a bubble bath for our dolls! Children used their observational skills to create self portraits.